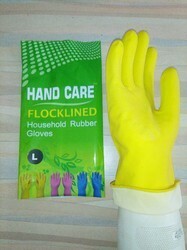 - Cotton Flocklined industrial nitrile (Acrylonitrile Butedine Rubber) Gloves. - Available in Green Colour. Green Extra Large Nitri Care 15 - Nitrile Gloves with Flock Lining 13"